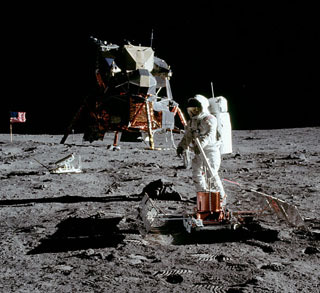 Astronaut Buzz Aldrin set up the device, visible in the background of this photo. Photo courtesy of NASA. Forty years ago, Lick Observatory shot a laser at a small reflective target on the moon to precisely measure the distance to the moon. In their first task after the historic moon walk by Neil Armstrong, Apollo 11 astronauts placed the Lunar Ranging RetroReflector (LRRR) on the moon, recalls research astronomer Remington Stone of Lick Observatory in a first-person account of the project. The device, "an array of 100 beautiful corner cube prisms," was cut to return any inbound light exactly back to the source, writes Stone. But Stone, who was selected to operate the telescope during the experiment, describes being "at the center of the first difficulty, which was that we could not find the moon with the world's second largest telescope!" Stone's account is available online in the UCO News and Events section, under "Apollo 11 Anniversary." To read the Santa Cruz Sentinel's story about the experiment, click here.